The ultimate spa experience anytime you want. Just sit back and feel the stress melt away. Relaxation at the touch of a button! Room for friends and family, fits up to 4 people. Simple control with the easy to use control panel. Easy portability and storage with convenient grab handles for comfort and ease of transport, and carry bag. 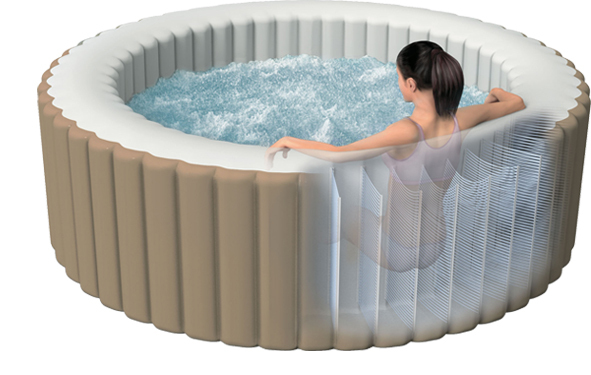 Includes Spa Cover to minimise heat loss with safety locking buckles to prevent access. Includes Ground Cloth to protect bottom surface and minimise heat loss. Easy Maintenance with the Floating Chemical Dispenser. Introducing Fiber-TechTM Technology, designed to offer superior structural stability while maintaining a comfortable surface for a luxurious and refreshing spa experience. Enhanced with lightweight, high-strength fibres for amazing durability and comfort.